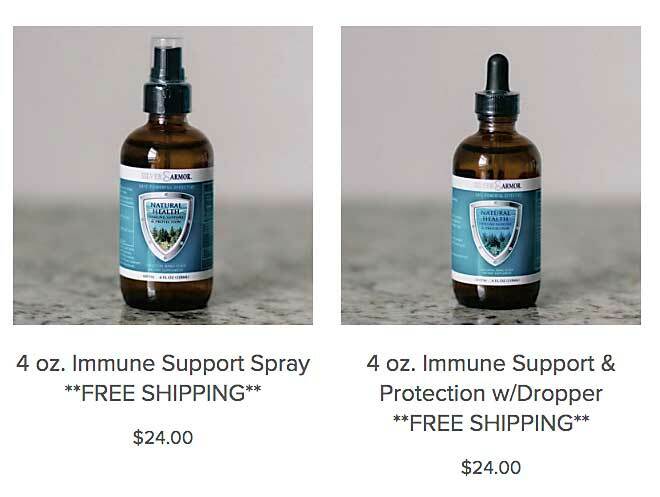 Silver Armor, a company located in Peachtree City, has received a warning letter from the Food and Drug Administration (FDA) pertaining to federal violations related to some of its colloidal silver products. For their part, Silver Armor co-owner Dina Dennis said the company is creating the documents, new labels and marketing materials required by FDA. Above, Silver Armor bottles offered for sale on the company’s website. The FDA’s May 17 letter noted several labeling and production requirements that must be addressed and cited violations relating to issues such as misbranded drugs and dietary supplements. The letter did not impede the ongoing sale of the company’s colloidal silver products, which continue to be sold. The point made by FDA was that over-the-counter products containing colloidal silver and represented to be used for treating human or animal medical conditions are regarded as a new drug for which approval application is required. “Your Silver Armor brand Natural Health Immune Support & Protection products … are intended for treatment of one or more diseases that are not amenable to self-diagnosis or treatment without the supervision of a licensed practitioner; therefore, adequate directions for use cannot be written so that a layperson can use your products safely for their intended purposes,” the letter said. Commenting on the FDA inspection and subsequent letter, Dennis said, “In October of 2017 we received our first inspection from the FDA. During our inspection we opened up our lab and demonstrated all of our sanitation, manufacturing, bottling and labeling processes to our inspector. Even though we were able to demonstrate these processes, because we did not have them in writing, they were listed as infractions in the original inspection report. Since the inspection report we have been in the process of creating our GMP (good manufacturing practice) documents. Is colloidal silver (microscopic particles of silver suspended in purified water), and the use of silver, something relatively new that is attempting to compete with antibiotics? Over-the-counter silver dietary products were restricted by the FDA nearly 20 years ago, according to WebMD.com. “In 1999 the U.S. Food and Drug Administration (FDA) ruled that these colloidal silver products were not considered safe or effective. Colloidal silver products marketed for medical purposes or promoted for unproven uses are now considered ‘misbranded’ under the law without appropriate FDA approval as a new drug. There are currently no FDA-approved over-the-counter or prescription drugs containing silver that are taken by mouth,” according to WebMD.com.